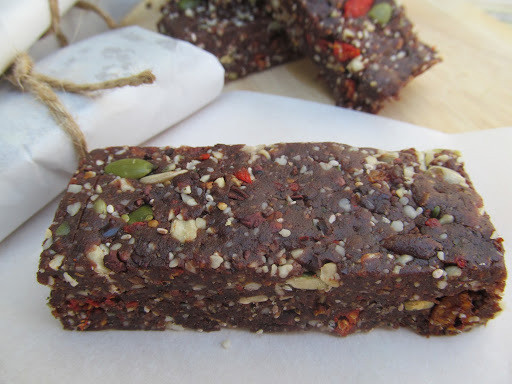 One thing I am always in search of is a good energy bar. After so many years of trail time, my husband and I have had our fill of the packaged energy/protein/power bar. 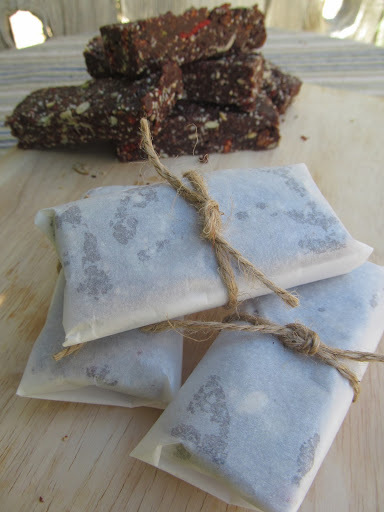 We are always on the hunt for new recipes for homemade bars packing some sort of super-nutrient punch. Today I had a hankering for some of these Chocolate Energy Bars. They are perfect for a long day on the trail or a day at the crags. Make them into mini bites and they are just the sweet thing to top off a healthy lunch during a long work day or a little pick-me-up any old time. These bars are so yummy and very satisfying. I thought I might need a little bit of this goodness to get me through the coming week. My most cherished cookbook is Superfood Cuisine by Julie Morris (her most recent edition is titled Superfood Kitchen). It definitely holds a prized position in this kitchen! 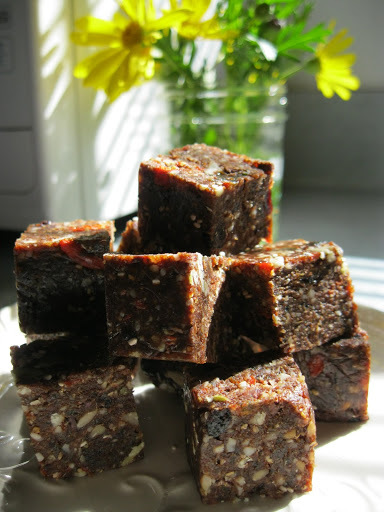 Her recipes are naturally delicious and packed with superfood goodness. Not to mention, they are oh-so-beautiful. I love recipes like this because you can easily tailor it to your own taste. Don’t like almonds? Use walnuts. Don’t have maca? Leave it out. Choose your favorite nuts, seeds, dried fruit and make it your own. Recipes like these lend themselves well to modification and my own variation is a little different every time. So, gather your favorite ingredients and make it your own. Bars like this almost always start with a base of dates and some type of nut. Mine vary slightly every time I make them based on whatever nuts I happen to have around. This time I use almonds and cashews, but I often use walnuts, pecans or a little of each. Again, any of your favorite dried fruits would suit this recipe just fine. 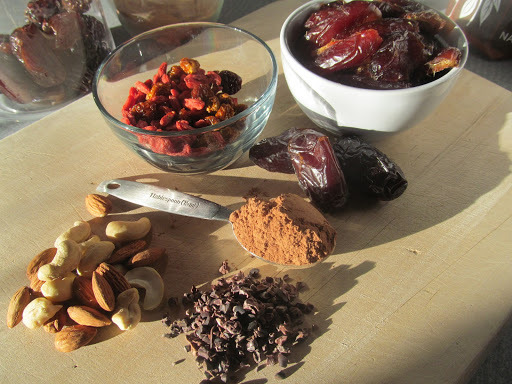 I like to use a combination of goji berries, goldenberries and Turkish white mulberries, my favorite superfood trio. Generally, I am not much of a chocolate-lover, though I do enjoy a good chunk of chocolate from time-to-time. 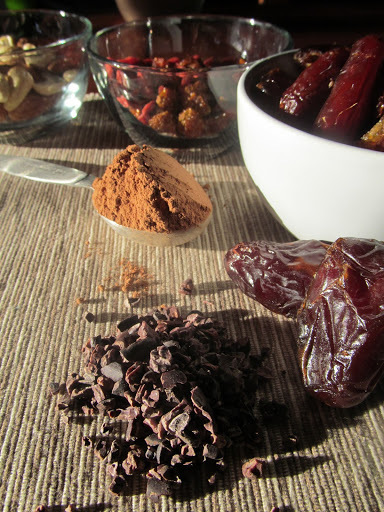 But I consider the raw cacao powder and nibs to be an essentials in this particular recipe. Sure, if you don’t have raw cacao powder, you could use the traditional processed cocoa powder. But, just so you know: “Cacao is one of the most antioxidant-rich foods in the world” (Julie Morris, Superfood Cuisine). In fact, it is one of the most antioxidant-rich foods ever tested. Cocoa is great, but it is highly processed, therefore lacking many of the healthy benefits of cacao. And then there are the nibs…wowzer! Talk about going to the source. They are the crumbled up beans that come straight from the cacao tree. A handful of these guys will certainly lift your spirits and get you to the summit. The original recipe includes maca powder, which my hubby loves, but I prefer to leave it out. I find it just a bit to stimulating for me, but it provides an extra little energy. 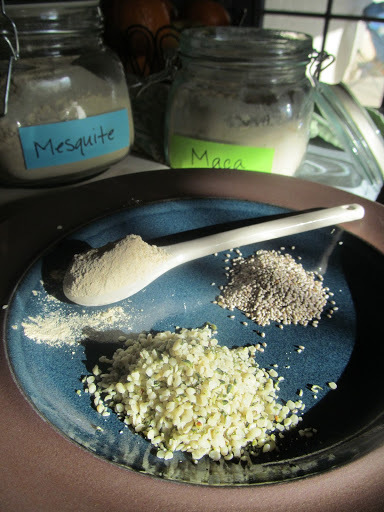 And now let’s gather the superseeds, maca powder and mesquite. Hemp and chia seeds are superfood staples. According to Julie Morris, “Hemp’s high saturation of protein is of a premium quality, as well – an easily digestible, plant-based, complete protein boasting all essential amino acids. Hemp also offers a wide range of minerals, especially iron, potassium, zinc and magnesium. Better still, hemp is an excellent source of fiber…”. Then there’s chia seed. Much like flaxseed, chia is a great source of plant-based omega-3 fatty acids. However, chia seeds are also high in antioxidants, a source of easily digestible protein as well as important minerals, like calcium and iron. Not to mention the fiber. These tiny, little seeds provide an easy way to sneak some superfoods into just about any meal or snack. Now that we’ve got our ingredients lined up, it’s just a matter of grinding them up in the food processor. Put all the ingredients in the food processor, except for the pumpkin seeds, sunflower seeds and dried fruit goodies. Grind ’em up until a course dough has formed. Check the consistency. If you pinch a bit of the dough and it doesn’t stick together, add a tiny bit of water and blend again until a good “stickiness” level has been achieved. 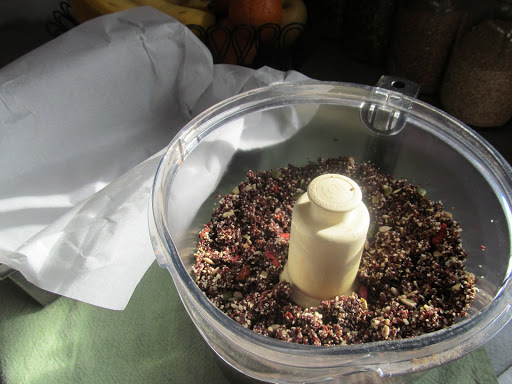 Then add the last 2 tablespoons of seeds and dried fruit. Pulse until coarsely chopped. I like to line a bread pan with parchment paper and firmly press the dough into the pan. Alternatively, you can place the dough on a piece of plastic wrap, form it into a rectangle shape, tightly wrap the sides of the plastic over the dough, press, shape and compact it into a 1-inch thick rectangle. Place it in the fridge to cool for a bit, then cut it into bars. Or, for a mini bit of pick-me-up, pack some little bites of chocolate energy in your lunchbox! Now wrap ’em up for packing or sharing. 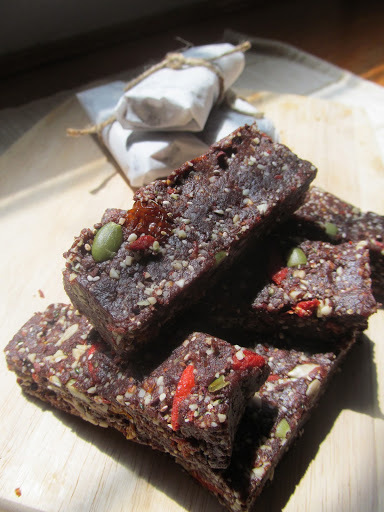 A wonderfully delicious, nutritious, superfood-packed treat for the trail or to share with friends.